Greening the Grid partners with stakeholders from across the power sector in Kazakhstan to build capacity for renewable energy development. Greening the Grid developed high-quality wind and solar resource data and analysis tools for Kazakhstan. These data provide important information for potential investors to make sound decisions about where to site new wind and solar projects. 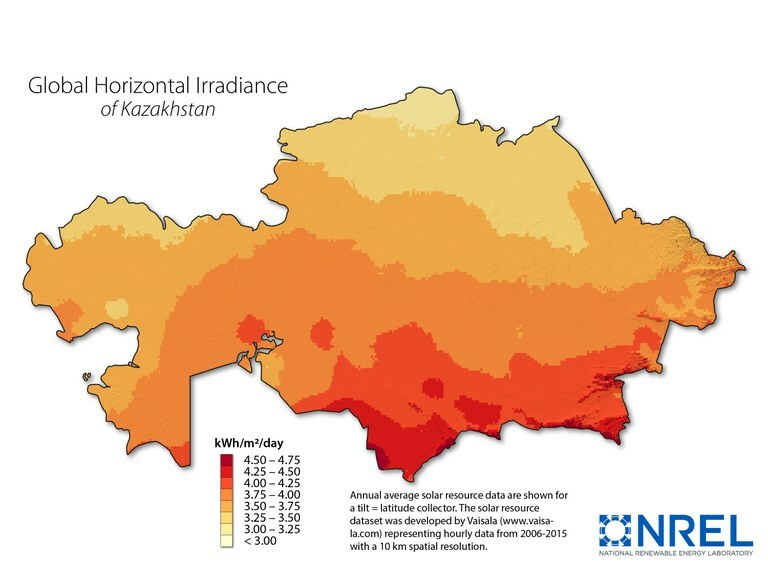 Under the USAID Power the Future initiative in Central Asia, NREL's National Wind Technology Center and Geospatial Data Science Team developed a series of new data sets to support the development of wind and solar energy potential in five Central Asia countries including Kazakhstan. This effort includes a new assessment of wind resources using the latest approaches for satellite-based weather modeling with ground-verified bias correction. Wind resources were evaluated at 80m, 100m, and 120m hub heights with detailed information about shear/wind direction, temperature, air density, air pressure and temporal information. 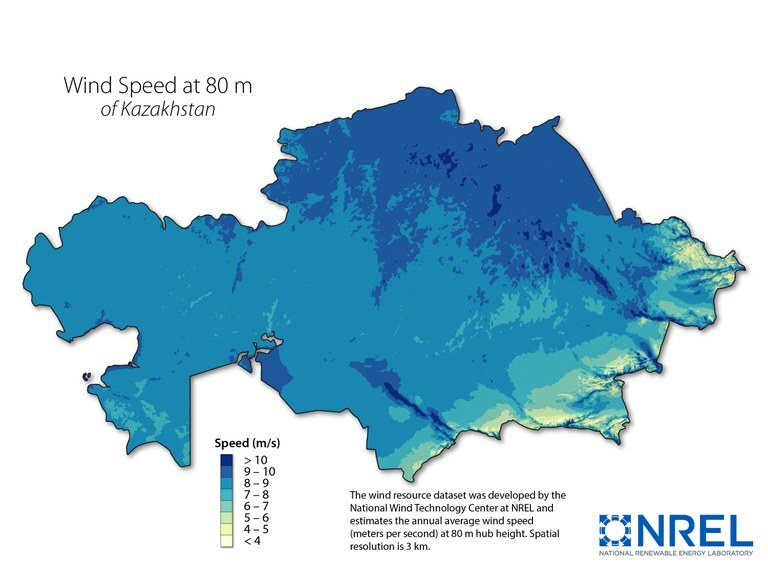 The 3-kilometer wind resource assessment for Kazakhstan was based on a combination of satellite-based wind data and historic ground-level wind observations, where applicable. Several reanalysis data sets and different physics schemes in the Weather Research and Forecasting model (WRF 3.7) were compared to establish the best base-line for the model. A reanalysis data set uses observational data combined with model simulations to calculate weather data, such as cloud formation and radiation, using different methods. The validate the model assumptions, the output of each configuration was compared to observed wind patterns at 11 different sites around the country during two week-long periods in 2015 that had high winds across the country. Examples of ground-based observations used to validate the model simulations are temperature, cloud cover, wind (speed and direction), and humidity. Next, different grid nudging methods were examined. Grid nudging can be described as comparing the fine-scale (e.g., 3 kilometer) model output to the large-scale (e.g, 27 kilometer) weather events observed at that same time, then "nudging" the fine scale output towards the large-scale reanalysis. This reduces bias in the fine-scale results while maintaining observed large-scale weather patterns. The resulting data set has a scope of one year representing the calendar year 2015. The model results at any given location or region are valid for 2015 and may not be representative of a typical year; however, it is expected that the average wind profile over several weeks/months will represent the typical average for that location. The variability in modeled wind speed over a season for this location is expected to be typical as well. Additional products developed will include an exceedance probability analysis based on multiple decades of wind and solar resource measurements. Visit the RE Data Explorer for Central Asia to visualize, analyze and download resource data for five Central Asia countries including Kazakhstan. 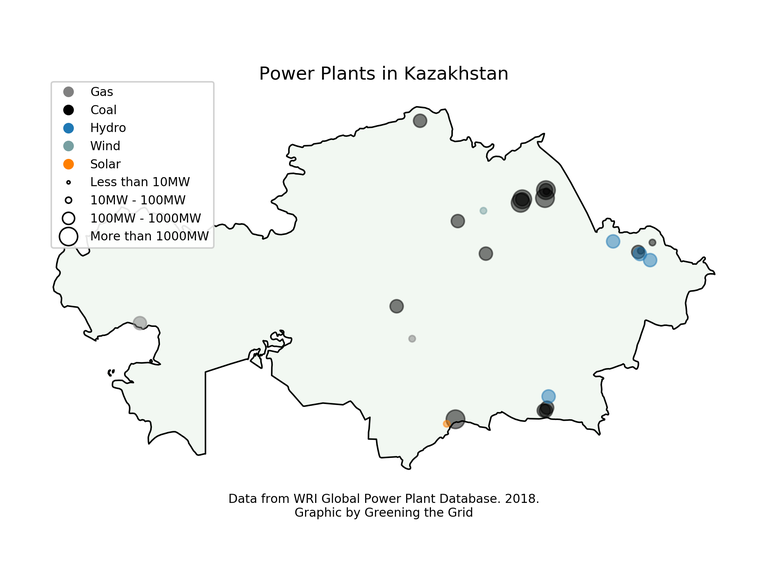 Greening the Grid partnered with the Kazakhstan Electricity Grid Operating Company (KEGOC) to assess the operational impacts of integrating 2,500 MW of renewable energy into the Kazakhstan power system by the year 2020. The map below shows the location, type and size of power plants operating in Kazakhstan.